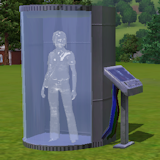 Your Sim wont Age, or feel the passege of time. Set Timer or leave Sim Frozen forever. Also Useful for storing dangerous criminals.